Negative is refusing consent, as to a proposal . Negative is expressing refusal to do something. Negativeis encouraging or noting an unhealthy or unbalanced outlook towardsomething. Negative thoughts are like heavy dark clouds hiding the sun and the sky, making the day look gloomy and threatening.You have the power to scatter the clouds in your mind and bring back the sun and the blue sky into your life. It is in your power to chase away the clouds and make your day beautiful, shiny and full of light. How much do you allow negative thinking to take over your life? The more you allow negative thoughts to occupy your mind, the more negative your life becomes, and in time, negativity becomes a habit. You need to learn to know how to stop negative thinking. Sometimes, if negative thinking is too deeply set in, one might need some professional help. However, in most cases, some inner work on your part is what you need, and this can make great changes in your life. 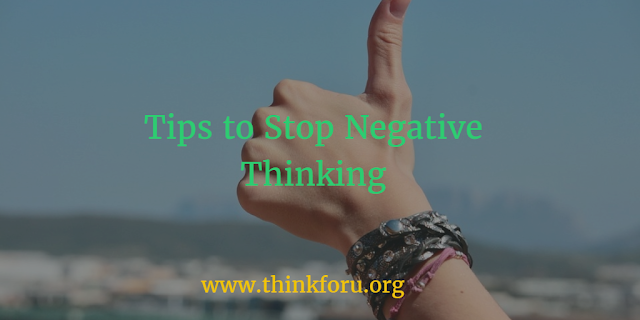 In this article, you will find a few simple and easy tips you can use to help you stop negative thinking. Smiling might be difficult, if you are angry, unhappy or depressed. However, even if you force a smile, it does have an effect. The act of smiling sends blood and oxygen to the face, and this improves how you feel. Try to smile more often. If you look around you, you and will always find reasons to smile. If you find it awkward to smile when you are not in the mood for smiling, then, force yourself to smile in front of the mirror when you are alone. This will help you change your mood and relieve stress. When stuck in a negative mood, call up or meet a positive friend, who is usually full of energy, happy and positive. Talk about anything you want, except your problems. You don't have to transfer your problems and moods to him or her. Try to do things and act, in the way your positive friends act, so as to become more positive. Learn how to turn your dreams into reality with simple creative visualization techniques. Improve your life, find love, attract money, create success and much more. Listen to music to when you feel down and when your mind starts on spree of negative thinking. Romantic music, calm music, dance music or meditational music would help change how you feel, think and behave. Nobody likes to listen to problems. If you keep doing so, people will avoid your company, and this might lead to more unhappiness. Speaking about your problems over and again, eventually, develops the habit of staying negative most of the time. The more you speak about your negative experiences the more negative your mindset becomes. Avoid, as much as you can, repeating in your mind negative thoughts and narrations. When this happens, engage yourself in some activity you like, which requires physical activity. This would help you divert your attention to other things. Go for a walk, swim, or go to the gym, cook, bake, or go to dance or fix something at home. Don't act like a victim, instead, take charge of the situation. You don't have to choose to be hurt, feel lack of self-esteem or weak. Nobody can belittle you, unless you allow them. Nobody makes you feel like a victim, unless you allow that. Stand up and assert yourself. You have the right to happiness, self-esteem, happiness and success like everyone else. Be nice and kind to people. Greet the people you meet, and chat with them for a few moments. This would take away your negative thoughts, for a few moments, and sometimes, for much longer. Acting kindly and being considerate will make people treat you in the same way, and this will lead to feeling good, happy, and therefore, becoming more positive. Be a little more aware of the words you use in your inner conversations and when speaking with people. Avoid as much as you can the use of words that denote weakness, lack and absence of self-esteem. While watching the movie focus on it and enjoy it, letting go of anything that bothers you. Problem-solving skills have nothing to do with luck. Too often people who view the success of an individual or organization from outside looking in do not see the work that went into moving the yardsticks forward or in designing a new approach to a business model or in persevering when thousands of others would have given in and quit. Reading inspiring quotes always change one's mood. Quotes inspire, motivate and broaden the mind. It would be a good idea to read a few quotes in the morning and in the evening, and even carry a few with you on a piece of paper or on your cellular phone. I hope these few tips would help you, even if only to some extent, to stop negative thinking. When you know how to stop negative thinking you gain the power to scatter the clouds in your mind and bring back the sun and the blue sky into your life.